And while I’m on the subject (vent alert), I should add that I’m disappointed with myself for having paid such short shrift to Iraq over the past couple weeks. Even though The BAG has maintained a consistent eye on the war for at least the past four years, I have to confess that Iraq fatigue — having, yes, permeated down to the netroots — has lately sapped my motivation for tracking this blasphemy. The omission is more noteworthy given the way the war has devolved, over this past month, into a desperately ugly post-surge phase, with the U.S. military fully engaged in a Shiite civil war, while laying siege to a large swath of poverty-stricken, civilian Baghdad under a steady stream of increasingly flimsy rationalizations and propaganda. For all that, I recommend the Digby Post (Bring It On II) from yesterday noting how the thoroughly inept Condi Rice showed up in Baghdad with the remarkable capacity to make a bad situation that much worse. I also direct you to Bob Hariman’s piece, or, more accurately, an Iraqi citizen’s appeal (“Have You No Sense of Decency?“), yesterday at No Caption Needed. And, as a way to back-fill a little bit, I also refer you two revealing images over the past few weeks. 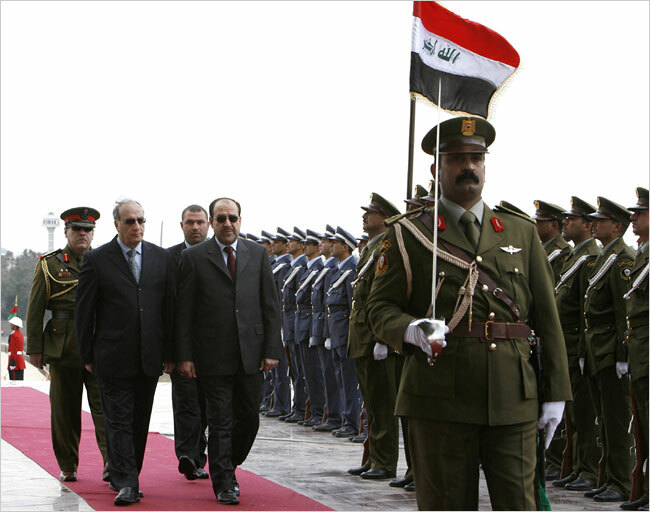 The first — showing Maliki as the two-bit puppet dictator he’s turned out to be — is paired with an article (“Secret Iraqi Deal Shows Problems in Arms Orders“) detailing how the Iraq government threw away billions on a secret, no-bid arms deal with Bosnia. And, following that, take a look at the photo-documentation of Iraqi military (“Desertions in Sadr City“) refusing to fight in Sadr City, leaving the battle to Americans and more hard-core military factions loyal to the Shiite powers that be.